Throughout history, people love a get rich quick scheme. Other people might fail, but I, yes I, will succeed! 1896 was no exception. A couple people find gold in the Klondike River in the Yukon Territory. Social Media (aka the newspaper) blows up in July 1897 and then everyone decides that packing up, moving north, trekking over dangerous mountain passes and then sailing in homemade boats for 500 miles is just the ticket. Instant riches for everyone! 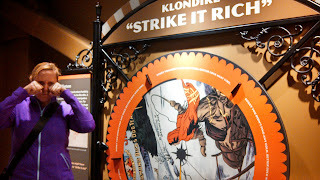 On Sunday, a friend and I visited the Seattle Unit of the Klondike Gold Rush National Historic Park as a part of our long weekend adventure in the Emerald City. It was just a happy coincidence that it brushed up against National Park Week. It was a cool rainy morning, so watching a 20 minute video was a great way to learn and stay warm at the same time, while thinking about people carrying a years worth of food over the White Pass or Chilkoot Trail. In the exhibit area, I spun the wheel to see if I would find gold. Just like you could never play Oregon Trail without having dying of cholera or getting a snakebite, you can't participate in the Klondike gold rush without going home cold, hungry and broke. Have you been to any of the sites (Washington, Yukon Territory, Alaska) that feature in the story of the Klondike Gold Rush?